There is just something about paper clutter that drives most people crazy. No matter what you do there never seems to be an end-all system to keeping those papers under control. Those papers that come in every…single…day. Whether you have school-aged children or you are an empty nester dealing with paper clutter is a never-ending battle that just keeps on coming in. To keep those papers from taking over every room in your home I am going to introduce you to my foolproof system that will help you organize paper clutter once and for all. 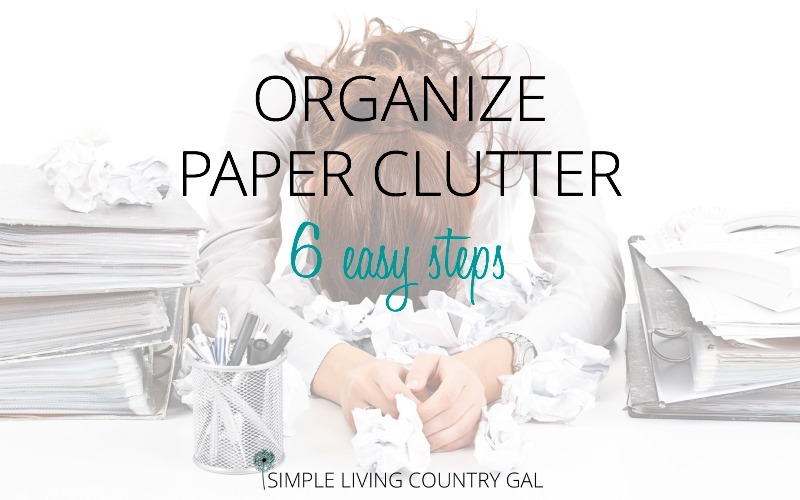 So, how do you deal with the paper clutter battle? Easy, you just need a game plan for handling things as they come in. A simple yet effective system that will tackle paper clutter once and for all. A system that will keep your paper clutter from getting out of control again. Before we begin let’s deal with what you have. Paper clutter can be one of the most dangerous forms of clutter we have. It is just so simple to put important papers into random piles and convince ourselves that this is a system. That those mortgage papers that were just covered up with a permission slip and wedding invitation will get filled out and mailed on time because of the pile you set it in on the coffee table. Well, you and I both know that this is not a solution. That placing papers in a pile to deal with later will not be efficient or effective. You need to see those papers as directions for tasks that are important enough that someone took the time to put them into writing. Those directions whether they be to pay this or respond to that will be the key to where these papers go in order to ensure they are dealt with on time. The best way to tackle this step is with a good old-fashioned clothes basket. Simply walk from room to room picking up every single piece of paper you find. Newspapers, magazines, mail, school papers, bills, and receipts. Gather it all up and put it into the basket. As you are gathering up all your paper clutter and you see something is trash toss it right then and there. This extra step will keep that basket from filling up too quickly and your head from exploding from paperwork overwhelm. Once you have gathered up all the papers you have found scattered throughout your home, you will want to do an initial purge of what you have collected. This step should be quick and decisive so try not to spend too much time here. You are looking to remove excess reading clutter at this point. Now, do not worry if you haven’t had time to read anything. You are in emergency mode right now and reading has been put on suspension until further notice. I promise you will have time to read again, but for now, we are strictly focusing on getting your head back above water. Gather up all the newspapers, magazines, catalogs, junk mail, coupons, flyers, and advertisements. Make it quick. Don’t think just do. You might just be surprised to find when dealing with paper clutter most of those papers are simply reading materials or just good old-fashioned junk. Now that you have things whittled down to the most important it is time to prioritize what you have left. This will ensure every single paper that requires your attention will get it. Now you can rest easy knowing that each important item will be dealt with and nothing will fall through the cracks costing you money or time. To do this step I find it easiest to set yourself up with four specific piles. High alert – Any papers that need to be paid, answered, or dealt with today…..right now. Top priority – Any papers that need to be dealt with within the week. Important – Any papers that need to be dealt with within the month. File – Any papers that have been taken care of and simply need to be filed away for y our records. Having a specific spot for all of your papers is key to saving time and keeping the daily paper from overwhelming you. Now, don’t overthink this step. 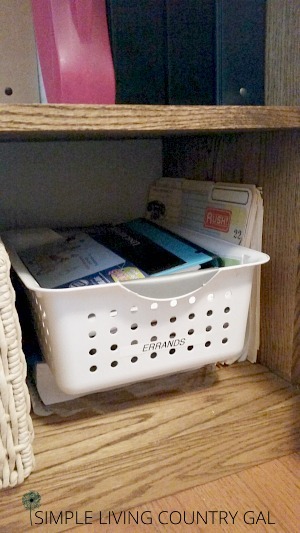 You simply need a basket, drawer or another container to place the papers from the categories we talked about above. High alert – I prefer to have this basket front and center sort of an insight in mind approach. A basket on your desk or on a kitchen counter should do the trick. Your goal is to always make sure this basket is empty. 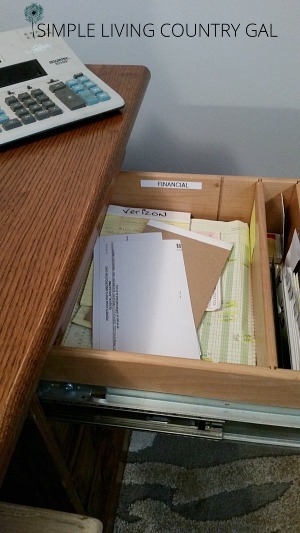 Top priority – A drawer seems to work the best for these types of papers. There is no reason to have important financial papers out where they can be seen or bumped and scattered. Having a drawer will contain your important papers so you can find everything you need when it’s needed. A desk drawer, a kitchen drawer, or even a drawer in your bedroom. it all depends on where you handle and pay your bills. By keeping this drawer close to where you actually work on your budget or deal with your finances will keep this location second nature and easier to find when putting things away. Important – Out of sight out of mind is not the best way to deal with the items in this category. Sure you can put things out of the way so you are not cluttering your counters up but you will want to make a date to revisit things later. I like to deal with my monthly papers at least weekly or every other. This ensures that these papers will not get overlooked. The purpose of creating a paper system is to make sure things do not fall through the cracks. Just because you have decided that these papers need to be dealt sometime within the next month does not mean that you do not need to look at this basket only once a month. The trick to avoiding late fees or missing deadlines is to stay on top of things. By spending just a few minutes each week looking through this basket and choosing items to work on you will never miss a deadline again. File – Okay, not a fan of filing. Not even close. But I do realize it is important and therefore attention must be paid. To help me keep on top of my filing I prefer to have a drop box and file everything in one shot. A drawer works best for this because the size of the drawer will keep you from getting too far behind. There is nothing worse than wasting time looking for things so do not be tempted to save your filing for too much later. The end of the month seems to be the best time to deal with filing and making a note on your calendar will help you to ensure it is done. A new month is not only a chance to turn the page in your calendar for a fresh clean sheet but also a chance to clean up your files. This video walks you through exactly how I use this system to stay on top of my paper clutter. However, I do ramble just a bit. 🙂 If you want to skip that part (and I don’t blame you) you can go directly to minute 3:20. The secret ingredient to any organized area of your home is a system. Yes, decluttering is important and setting things up in an organized way is also something that cannot be overlooked. But, if you do not have a system for dealing with your new organized area you will quickly find yourself back to square one. It is important to not overthink this part or get overwhelmed with what happens when. You are simply looking for a set of steps that will get you from point A to point Z in a quick nonstressful way. A system is a gameplan nothing more. The best way to create a system is to walk through exactly what happens when paper enters your home. For this example, we will call on my friend Susie. Susie arrives home from a long day at work. She walks into her kitchen with the mail, her first batch of paper clutter. She tosses the pile onto the kitchen counter and sets about starting dinner. Her daughter comes in a few minutes later to say hello. She hands her a stack of papers she brought home from school. Susie now busy with the cooking sets the papers on top of the mail clutter and goes back to her cooking. Finally, her husband comes home as Susie and her daughter are setting the table. He has a newspaper, a flyer about an upcoming picnic and few magazines he brought home for her to look at. He tosses this paper clutter stack randomly 0n the counter in the vicinity of the first pile and heads over to the table. An hour later, dinner is done and you are now looking at a pretty impressive stack of papers. Step 1 – Gather up all the papers and sort through each item using the categories above. Toss any papers you do not need as you are going through things. Step 2 – High alert items should be dealt with right now. Permission slips, RSVP’s, overdue bills, etc, these items should be dealt with immediately so you do not forget later. Seriously we are talking minutes to complete all of these important things. Try to touch each paper once. Deal with it so you can forget it. If you do not have the time or the tools to deal with a certain high alert item you can then place it into your high priority basket. At the very least you now know it will get dealt with that day or the next at the latest. Step 3 – Put top priority items into your bill paying drawer knowing each item in this drawer will get dealt with within the week. Step 4 – Put important items into a basket to be looked at within the month. I like to call this my weekend basket and go through things on Sundays when I have time to look these papers over. Step 5 – What you have left should be magazines, newspapers or catalogs and coupons. Put these items wherever you read them or deal with them normally. The coffee table, bathroom or nightstand are a few examples that come to mind. Coupons or flyers can go into an errand basket so the next time you write up your shopping list you will have all sales information and coupons in the same spot. Yep, that is really all there is to it. Maybe 10 minutes tops to put papers where they will get the attention they need. You will want to fine-tune your system until it flows and is easy to follow. Once you do you will never have a paper clutter problem again. To take things one step further we need to create a paper clutter schedule. This just means that you do the same things at the same times until it is second nature. Friday is bill/budget day in our home so any papers filed into our bill paying drawer will each get looked at and dealt with accordingly. Sunday is weekend basket day so items that need to be looked over are each read and sent on to the next stage. Ninja Tip: Use post-it notes to make small reminders as you go over things. Once you have a post-it note you will find it easier to move each paper to the next stage such as bill paying or errands. By setting up reminders you will learn to stay on top of things easier. I love to have set days for dealing with things in my home. This really helps to keep all my I’s dotted and my t’s crossed and no more am I finding things, important things, are falling through the cracks. When learning to deal with paper clutter it is important to have a simple yet foolproof system to deal with all the items that enter your home on a daily basis. Once you have found a way to deal with the paper clutter daily and you have that new system set as second nature you can rest knowing those papers will not get out of control again. The next step is to deal with those important papers weekly and the semi-important papers monthly. By knowing you have all your bases covered you will keep the important things from falling through the cracks and a balanced budget will naturally fall into line. As with all clutter, there never seems to be just one side effect but actually many. Deal with the clutter and finances, other rooms, schedules, and family life will all naturally begin to fall into place and with it your sanity of finally dealing with what each day has to throw at you. You will be pleasantly surprised how this system will help you organize paper clutter once and for all.